Recently I took a trip to the Alvord Desert that didn’t quite go to plan. I’m quite certain my friend Dan probably doesn’t want to relive this experience, but it was definitely a trip I will always remember and worth sharing. First, the Alvord Desert is in SE Oregon, and is about 8 Hours from Wilsonville. Dan, Jesse, Nicole and I, as well as Nicole’s dog Luna and my dog Chewy, met up at Dan’s home to take his Jeep Cherokee and trailer. The drive was long but good company helps so it went well. Jesse works nights, so basically slept the entire time. As the sun fell we looked for a spot to shoot the beautiful sunset along the highway. When we stopped, I raced out into the field and under a fence to get a better composition, only to miss the good lighting. When I turned around I saw some sweet lighting in that direction, so I went back under the fence, across the highway, under another fence and raced up the hill to get a better composition of the lighting that direction. I again failed to get the shot that I wanted, but this one isn’t bad. I guess I really wanted that home run. About an hour later, I reached for my phone to see what time it was… ut oh… where’s my phone? I would say the only thing worse than losing your phone is losing your wallet, but I’m confident that with the next generation phone, it will be on par. I had a good idea where it was, but adding 2-3 hours onto our trip this late would have been brutal, so I decided it was best to look for it on our way back. We arrived at Mann Lake, which is about 30 minutes from the Alvord Playa, where we docked the trailer, and helped Nicole setup her tent. The wind was absolutely HOWLING, so I decided to sleep in the Jeep, while Dan and Jesse stayed in the trailer. Before going to sleep we decided to head to the playa to check it out, so we piled into the Jeep, cranked up the music, and went for a drive. That place is soooo cool, and we all had a blast before heading back and getting some sleep. Actually, I think I was the only person who got any sleep that night because of the wind. When I woke up in the morning and got out of the car, we had these amazing puffy clouds lit up by the moonlight. I couldn’t wait to get this day started! We decided to just take the trailer out to the playa, since we were going to be saying here 1 more night, so we packed up what we needed, hooked up the trailer and started on our way… only something was wrong. One of the tires on the trailer wasn’t moving. When Dan had parked the trailer, he forgot to remove the grounding pin and when he pulled forward, he yanked it out. After fiddling with it for about a half hour we decided to just come back for it later, and we pressed on. One of the things I love about Dan is that he always does a ton of research before going anywhere, and he had an idea for a place he wanted to drive to. Keep in mind that the previous night we had covered a lot of ground driving on the playa the night before, and everywhere we drove the ground was bone dry. 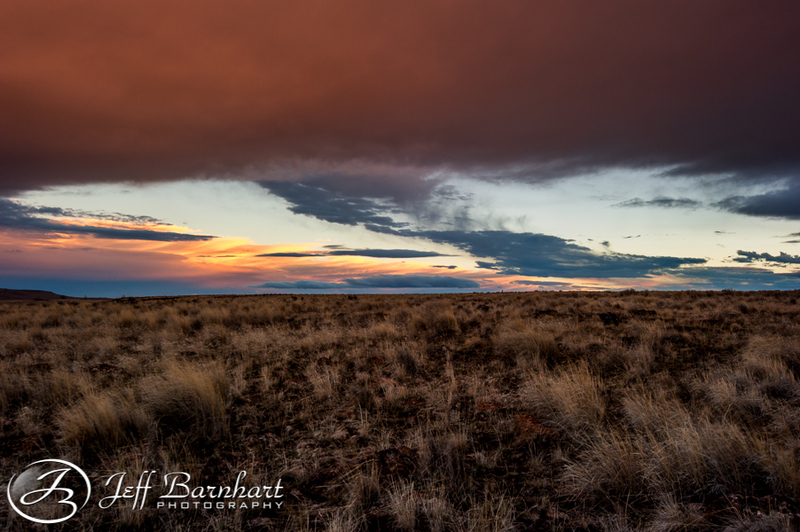 As we drove to the spot to shoot sunrise, Dan noticed that the ground had become significantly softer, and before Dan realized how soft, he turned and stopped… it was too late. Even in the Jeep with 4 wheel drive, turning the wheels just dug us in deeper. We were stuck. Now, let me recap the situation. We drove 1 vehicle which was now stuck, all of our food and water was left back at the trailer, and although those of us who still had a phone did in fact have 4G, the nearest town was 2 hours away. I think the realization of our predicament hit us all at the same time, and decided we needed to figure out how to get out of here as soon as possible. Our first idea was to walk about a half mile to the “shore” and see what kind of wood or weeds we could find to put under the tires to see if we could get any traction. When we opened to door we could see that we were in DEEP, as the mud came all the way up to the frame. I stepped out and headed walked straight until it was dry, which in my estimation was about 150 yards. We walked to the shore and grabbed some tumble weeds and brought them back to the Jeep, and as we stomped them under the tires we watched a truly breathtaking sunrise come and go. As Dan tried to drive out, Jesse and I gave the Jeep a little push. Although Dan would probably disagree, it was laughable how little that worked. I equate it to holding a mattress on the hood of your car with one hand driving down the freeway. I think my only comforting thought at this point was that we got stuck far too easily, and there is no way that this isn’t commonplace. Plan B: God, I hope Plan B works, because Plan C involved eating Chewy. That’s what I told them, at least, but it was actually going to be Nicole’s Dog, followed by my 3 friends... I needed Chewy to catch wildlife. The hot springs were a little over a half a mile away, and I saw some people parked back at the entrance, which I think was a little bit over a mile. Perhaps they could pull us out or new someone that could. As we walked toward the hot springs, I noticed a car driving on the Playa, and so did my dog who sprinted straight toward it. The driver saw us, and came to our rescue. Apparently his dad seen us out there, and sent him to investigate. His truck was only 2 wheel drive so he called his dad to come out there with the big rig. Unfortunately his cables only stretched about half way, so they had to call for reinforcements. They were seriously some of the nicest people, offering us water and shelter if needed, and even gave Nicole warm clothing. The wind was still howling, but now at least it was on our side as it was quickly drying the ground. They finally had enough cable and once the cables were secure I was blown away how easily it was pulled out, and to thunderous applause. The day was still young, so we headed back to the trailer for a most delicious breakfast; French toast and bacon, with coffee. After breakfast we packed up, and Dan and Jesse worked on fixing the trailer. What they read online told them they needed to reset the power adapter. The screw to that box was stripped so they decided to use Jesse’s knife to pry it open. I wasn’t watching, but I heard Nicole gasp and sprint for the med kit, then I saw Dan come around the other side holding his hand up. With the blood splattered around Dan’s hand, it was obvious what had happened, and we needed to get to a hospital fast, but this isn’t the city. We were still in the middle of the desert, and the nearest city was an hour and a half away. Nicole said we had to get to the hospital in within 2 hours or things would get complicated. All 3 of them work for hospitals, so he was in good hands in terms of getting the proper care, but it was obvious he was going to need stitches, and we still had a problem with the trailer, which means we had 30 minutes to figure this out. It appeared that only one of the brakes was sticking, so Dan made the call to cut the brake line. Not ideal, but obviously better than nothing. It appeared to work so we went on our way. It was 10 minutes down the road when we started to smell something burning, so we stopped in the middle of the desert road and watched the cloud of smoke billow past our windows. Yep, that’s the smell of brakes. Our only 2 options at this point were to leave the trailer there with all of our gear, or unhook the electricity all together to release the brakes. Since we were in such a remote location, we decided on the latter. When we arrived at the hospital we dropped Dan off and parked the car. Dan insurance company towed the trailer on a flat bed home, and 16 stitches later, we were on our way as well, but first a much needed stop a Dairy Queen for some ice cream… No Dan, we can’t have sprinkles. Those are for winners. On our way home we stopped to look for my phone. We gave it a call but it went straight to voicemail, so obviously it was turned off, or perhaps dead from rain. Being resourceful, Dan used the geotag from the pictures he took the day before to get us pretty, and it’s not like there were a lot of pull outs on that road so it was easy to find. What wasn’t easy to find was my phone. Funny thing, I was able to find a doggy poop bag that I had dropped, but not my phone. Right now I’m using my old phone until the Samsung Galaxy S6 arrives… it better be awesome because I could have an iPhone 6 right now, this phone is brutally slow. Laughed hard at your adventure in life. There are some days if you didn't have bad luck, you'd have no luck at all! Your picture is awesome - as always.